What Brings People to SOE Live? BRING IT! SOE Live 2014 Player Panel submissions are OPEN! It’s hard to believe this will be EQ2Wire’s seventh Fan Faire nee SOE Live. And it’s hard to believe that this will be our third year presenting a player panel on EQ2U and Data Feeds (Census) in general. Talking to players before and after the panel, and presenting what we’ve been working on, is certainly the highlight of the event for me. If you will be at SOE Live and have ever had your own idea for what kind of player panel, put your name in the hat and you might just get to do your own panel! One of our favorite features of SOE Live are the player panels. We love ’em, YOU love ’em and they’ll be back for 2014! We’ll have panels each day, and will work to avoid scheduling conflicts with the major game panels of the event. Mastering the art of… ? An amazing topic that we’ve never thought of! WOOT! I’M EXCITED TO SUBMIT A PANEL! We’re accepting panel submissions NOW, and until midnight Pacific Daylight Time, June 27th, 2014. We anticipate more applications than we have timeslots, so spend plenty of time on your submission to make sure it really shines! We will contact all panelists by July 9th to advise whether or not the panel is accepted. All accepted panels will be scheduled as soon as possible after that date. Everything about last year’s SOE Live was bigger — the crowds, the announcements, the lines! Ok, so that last one was a bummer, but while we’re hoping the player turnout and announcements stay big, the lines have thankfully been nerfed!! Sign up for SOE Live by May 12th and not only do you get a discounted rate ($129 for the entire weekend), but your badge will be mailed out to you well in advance, so the only thing you have to wait for when you walk out onto the Mezzanine is the inspiration to choose which game developers, artists, players, or vendors you want to chat up first! New this year, you and your Guild, friends, and/or family can reserve a 12-seat table at the Welcome reception (the Grand Banquet reservations have already filled up). There are still some things up in the air about SOE Live, namely the exact Official & Player Panel schedule — signups for Player Panels aren’t open yet — and whether the Friday night party will be near a pool or be moved to some other venue. Hey as long as there are more than 2 bartenders for 1,500 guests, I don’t care if it’s in the hotel basement. I heard people were hitting up the well-stocked yet reasonably priced liquor store in the Miracle Mile just to keep their buzz on! And yes, I’ve already signed up to attend what will be my SEVENTH SOE Live and I hope I will see you there. I’ll be recording all the EQ2 panels as always, although it’s never the same as being there and being able to ask your questions directly of the devs! SOE Releases Info on Live Events at SOE Live, Int’l Players Open to Tournys and Contests For First Time! Get Your Game on at SOE Live 2014! Just posted over at the official forums a few details on Live Quests and Tournaments for all the games. Big Highlight — International attendees may participate! Every year at SOE Live we offer a schedule full of panels featuring the games you love to play, games you can’t wait to play, and other burning topics any SOE Gamer would find interesting. The schedule always includes activities like Live Quests and Tournaments. Brand new this year: International attendees may participate in our Live Quests and Tournaments! Detailed rules and prizes will be posted in the coming weeks. We wanted to get this information out to you before Early Bird registration closed! Check out the ways you can participate! The Early Bird Gets the Loot: SOE Live Registration is Open! You know it’s spring when the flowers are blooming, the birds are singing, and gamers worldwide are planning their trips to Las Vegas for four days of non-stop awesomeness at SOE Live 2014! The annual gathering of players is happening this year August 14-17, 2014, and gives fans a chance to meet and get an exclusive look at what’s new in their favorite games. Did you know that by registering early, you gain access to great options to make your SOE Live experience that much more epic? After the jump, check out this years’ Early Bird offerings including Group Table Reservations ($5 a person for a table of 12), Mailed Out Badges (no 3 hour lines this year! ), Special Hotel Rates, and more! It’s official! 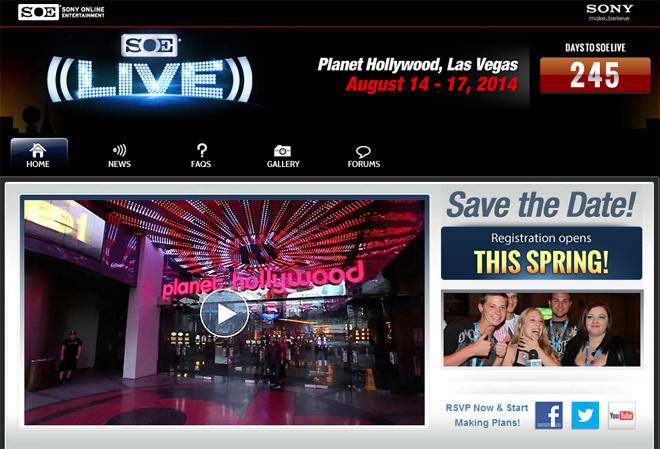 SOE Live 2014 is set for August 14-17, 2014 returning to Planet Hollywood in Las Vegas. Registration will go live next Spring. Hopefully a Mobile Data solution can be found so that article posting, tweeting, and facebooking is possible from the convention floor. It wasn’t last year (unless you paid $25 for 3 hours of Wifi), greatly diminishing SOE’s social media presence over the all-important weekend of EQNext news. It’s also too early to tell if events will spill into Sunday afternoon as they did last year, but now, people can start asking for days off work to attend! Join members of the EverQuest II Art & Animation team including Tim “Haohmaru” Heydelaar, Tom Tobey, Dave “Covic” Brown, and Aaron “Gnobrin” Bisnett as they talk about what it takes to create new zones, characters, and weapons for EverQuest II, as well as previews of upcoming zones and artwork! the exciting new Terrain Editor! NOTE: Silence in the first 1-2 minutes of the video, followed by frantic tripod setup noise for another minute is perfectly normal. 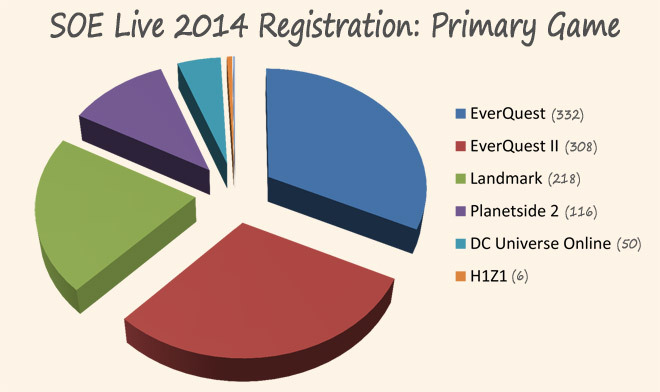 Welcome to the EverQuest II: Itemization Evolves panel from SOE Live 2013. Panelists are Michael “Xelgad” Ganz, Brian “Omougi” Ferguson, and Kyle “Kander” Vallée. Disclaimer: All things discussed about the expansions are subject to change! 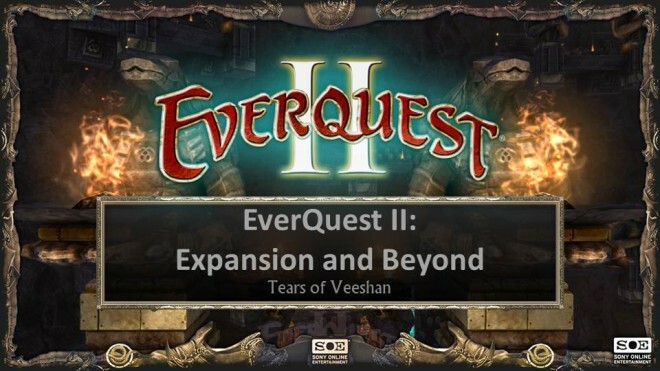 Welcome to the EverQuest II: Tears of Veeshan Expansion panel from SOE Live 2013. Welcome to the EverQuest II: Systems panel from SOE Live 2013. Panelists are Michael “Xelgad” Ganz, Brian “Omougi” Ferguson, and Kyle “Kander” Vallée. Disclaimer: All things discussed about the expansion are subject to change! 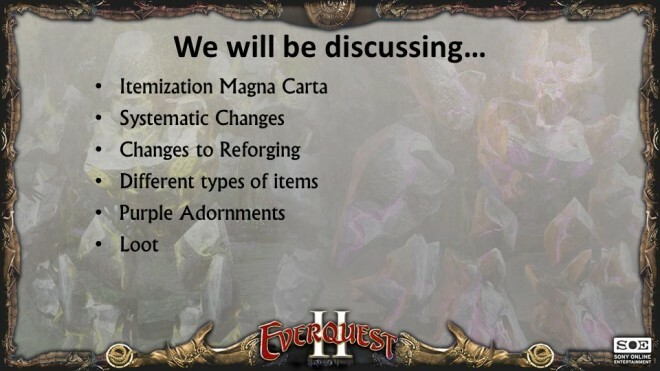 Itemization will be discussed in our next systems panel: EverQuest II: Itemization Evolves. Welcome to the SOE Live 2013 Welcome Reception. Tonight includes a keynote about EverQuest and EverQuest II, no doubt with a teaser of their upcoming expansions. The Keynote is scheduled for two hours starting at 7pm PDT Thursday (10pm EDT, 3am BST, 4am CET). This was a liveblog hosted by Blyve. Go back to the days when gear was less cookie cutter. The days when you looked at more than just the Stamina stat to see if you were already wearing better. Bring back heroic zone progression meaning make the top level heroic instance hard. As in “need to gear up in the easier instances before you have any chance at clearing it” hard. Remember zones like Palace of Ferzhul, Estate of Unrest, Tower of Tactics, Elements of War? This was something we used to work towards so it gave us a goal. 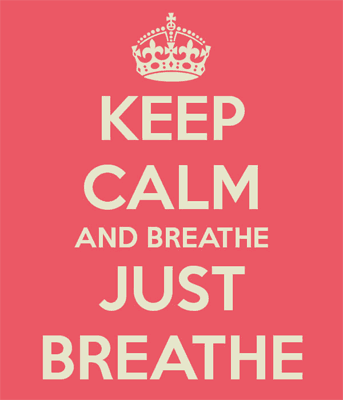 Lately, we can clear the harder zones the first or second time we go in. If we can clear the hardest zone, what are we working towards? Put the items in places that make sense. If zone X is required to get access to zone Y, and the quest sending me into zone X rewards me with boots, don’t put worse boots in the loot tables for zone Y. Nobody will ever wear them and it makes it seem like nobody was paying attention when placing the loot. Put ultra-rare items into the heroic zones again that are desirable even by raiders. This gives us something to do. I remember people asking to run zones like Cella, Maidens, Najena’s Hollow Tower, even Obelisk of Blight way back when because they wanted an ultra-rare item that dropped in there. Quite often the next GU or expansion would come out before everybody got what they wanted out of all the zones. Again, this gave us something to work towards. These don’t sound like difficult things to do and they used to do things pretty much like this until the last couple of years. Hopefully they go back to this way of doing things and will give us heroic group runners something to work towards again other than Obols, Spirits, or whatever other new currency they come up with. Sony Online Entertainment‘s SOE Live event is promising to be bigger than ever this year, as the company is reporting that advance passes are sold out and that walk-up tickets are expected to do the same, and quickly. SOE Live 2013, which takes place August 1st through 4th at the Planet Hollywood Resort and Casino in Las Vegas, is surrounded by hype thanks largely to the long-awaited debut of EverQuest Next. SOE will also host five tournaments, a silent auction, a pool party, and talent and costume contests. We have two Massively staffers on deck in Vegas: MJ Guthrie and Karen Bryan will be covering news as it happens. EQ2Wire will be (where else?) in Las Vegas this weekend for our sixth SOE Live covering EverQuest II, as well as the upcoming EverQuest Next on our sister site EQNWire.com. I’ll also be presenting a panel about our EQ2 armory site EQ2U as well as plans for the future. You can read the official SOE Live 2013 Schedule here (hopefully with no more changes! ), but here’s the list of panels I will be attending, with notations of which panels I will be Liveblogging and which I will be recording in 720p HD video. All times are Pacific Daylight Time! EQ2Wire/Dragon’s Armory Meet Up! – 4-5pm — If you are in Vegas, join us in the Planet Hollywood Mezzanine. We’ll find a comfortable place to sit, either in the Lounge or Theater and chat. Welcome Reception and Keynote Address – 7-9pm – Covering EverQuest and EverQuest II. This will also be livestreamed on Twitch.tv. EverQuest Next Debut – Noon-1:30pm – First look at EverQuest Next! This will also be livestreamed on Twitch.tv. EQ2U & Dragon’s Armory Player Panel – 2-3pm – The future of EQ2U, plus Dragon’s Armory will unveil a major revamp! EverQuest II: Systems – 3-4pm – Classes, Tradeskills, PvP, and more. EverQuest II: Expansion #10 – 4-5pm – EverQuest II’s 10th expansion. EverQuest II: Itemization Evolves – 5-6pm – Hear about some great things coming to EQ2 Itemization. UPDATE: Upon reflection of viewership numbers, lack of any kind of cellular data service in the conference rooms, and the high cost of Wifi in said rooms ($25 for 3 hours), and thus being unable to post photos in realtime, I’m NOT going to be Liveblogging on Saturday. A ton of EQNext info has been released on game sites and social media. So we’ll be recording a ton of panels in 720p HD video and releasing in the following days! Thank you! EverQuest II: Art & Animation – 10-11am – Monsters, Dungeons, Animation, Armor and more! The biggest holes in my schedule are Friday’s “The World of EverQuest Next” (5-6pm) panel as it conflicts with an EQ2 panel, and Sunday’s “EverQuest Next: Inside the Writer’s Room” (Noon-1pm) and “EverQuest II Q&A” (1-2pm) which takes place after I’ve left Vegas. We are hopeful that at least one person will produce a High Definition tripod video of each of these three panels and then share them on Youtube. EQ2Wire SOE Live Schedule Webapp Updated! I have just finished updating our EQ2Wire SOE Live Schedule webapp based on the massive changes to the SOE Live schedule made last Friday, as well as the additional changes made today to Considering the depth of the changes to the official SOE Live Schedule. Grab the EQ2Wire SOE Live Schedule webapp for your iPhone, Android, Windows Phone, Blackberry, Palm, etc. Remember, this app lets you pick your panels and add them to the “My Schedule” feature. NOTE: This webapp uses a Manifest file to cache the schedule even for a device in airplane mode. If you’re testing this on a PC or Mac, you may need to reload your browser several times, and even close and reopen the browser to get the new version to load. I suggest an Incognito window in Google Chrome, or otherwise completely clear your cache before attempting to load the page. The latest version number at the time of this writing should be 1.08 and a date of July 29, 2013. Looks like I wasn’t the only one experiencing a bit of trepidation about 6 hours without a bathroom break. The SOE Live 2013 Schedule has undergone some pretty major changes, not only in times, but in which rooms are being used. The Friday panels have shifted, and all the panels set for Melrose have moved to the Sunset or other rooms. More importantly, the EverQuest and EverQuest II keynote information has moved from 11-Noon on Friday to Thursday night as part of the Welcome Reception. EQNext now gets its own dedicated 90 minute reveal starting at Noon on Friday. The SOE Live 2013 Schedule has been updated on the SOE Live website. NOTE: Changes are STILL being made, and neither Greg’s SOE Live Schedule app nor the EQ2U app has been updated for the new schedule yet. After the changes shake out, stay tuned for an update for when our schedules are updated! SOE Live 2013 is coming up on us fast, and we want to get you revved up for the cool info, prizes, and fun you’ll see on stage at Planet Hollywood or (if your spending priorities include eating and paying rent) online via our livestream! Here’s a quick rundown of the SOE celebs that’ll bring you all the action! Mark spent 17 years doing morning radio programs (proving again that ANYONE can get into the gaming industry). Mark will bring a quirky, fun air to the Reception and Grand Banquet. If that doesn’t work, he’ll just buy your love with prizes. 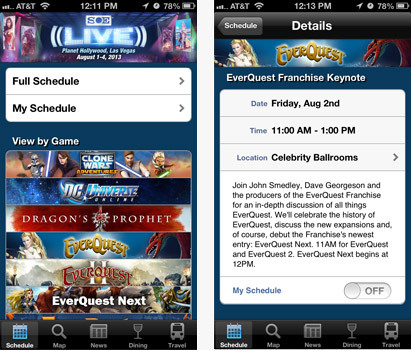 Greg “Rothgar” Spence, now Lead Programmer for EverQuest Next, has updated his popular SOE Live Schedule app for SOE Live 2013! Greg developed this iOS app three years ago and, in his extremely limited spare time, has maintained it every year for SOE Live, adding Retina and iPhone 5 support over time. This app has a “My Schedule” feature which lets you choose which panels should appear on your schedule, as well as providing Dining and Transportation information. 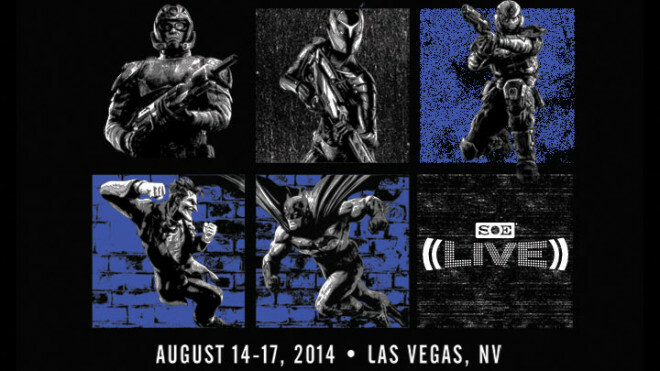 SOELive is your official guide to Sony Online Entertainment’s SOE Live convention. Access the full list of panels and events and even build your own custom schedule. View maps of the convention floor, keep up-to-date with a live news feed, view a list of nearby dining options and access important travel i0nformation. Confirmed: SOE Live Discounted Rate @ Planet Hollywood is Finito! It does NOT look like we’ll be able to add rooms to the SOE Live room block. If anything does free up to us before the event, it doesn’t look like it will be at the same prices listed in the SOE Live FAQ. It looks like some people have good suggestions for other nearby or cheap hotels in Vegas. Before walking the Las Vegas Strip, just be aware that a Vegas ‘block’ isn’t as short as you think it is. So if you waited til the last possible moment to book SOE Live and pay at the door, you’ll want to shop around other hotel options. Players noticed earlier today that the SOELive code is no longer working on the special Planet Hollywood registration page. Players may need to investigate other hotels or can choose to wait with crossed fingers to see if PH opens up another room block at the SOE rate.